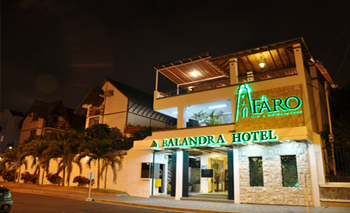 Hotels from Ecuador's Pacific Coast; including charming places such as: Balandra, Palmazul, Calippso, Atamari and more. 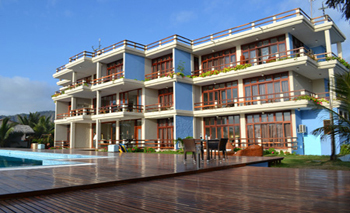 The Hotel Casa Ceibo is located at the coast of Ecuador, 20 miles south of the equator in the Río Chone estuary and 5 miles from Caráquez Bay. The boutique hotel was built by local artists and craftspeople, and most of the products and materials used in the hotel are Ecuadorian. The upper hall of the hotel features original artwork by some of the nation's most respected painters. Downstairs guests can enjoy a long corridor exhibiting the past life of Caráquez Bay during the beginning of the last century through a unique collection of historical photographs which were part of the Museo del Banco Central del Ecuador. 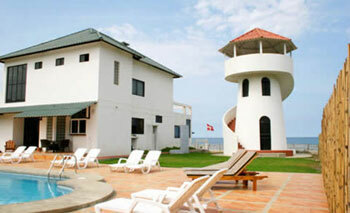 The Hotel Calyppso is located at the ocean front of Salinas, the best seaside town on the Ecuadorian coast. There are modern facilities for those who look for amusement, intense night life, nautical sports, adventure and an encounter with nature at the sandy beaches. Salinas is well known for the sport fishing and whale observation. You can also enjoy the Ruta del Sol filled with kilometers of beaches and a very pleasant climate the whole year. Mantaraya Lodge is located in the Machalilla National Park in the province of Manabi a 15 minutes drive from Puerto López. With a beautiful Mediterranean style construction, it's the perfect place to relax and visit the Machalilla National Park. Among the numerous attractions are: Isla de la Plata (off the coast of Puerto López), Los Frailes Beach, the archeological site of Agua Blanca, Salango, and the beaches of Puerto Rico and Puerto Cayo. 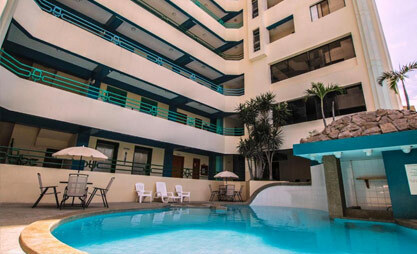 Guests can enjoy the use of the swimming pool and the delicious Ecuadorian food served in the restaurant. This stylish and brand new hotel opened in January 2008 and represents a new trend in Ecuador where local artisan work is combined with luxury and comfort. Palmazul offers gourmet food, relaxing massages and aromatherapy at the Arena Spa, and helps you stay fit with its 60 foot swimming pool and its tennis court. The hotel's semi-private beach has only limited access for the public. You can stay at one of the 8 spacious double rooms or bring the family and enjoy one of the two apartments (each with two bedrooms). Alandaluz Inn's ecological building, mostly of bamboo, and its incredible sea shore location turn it in to the perfect place for exploring “Parque Nacional Machalilla”, one of the main tourist attractions on the Ecuadorian cost. 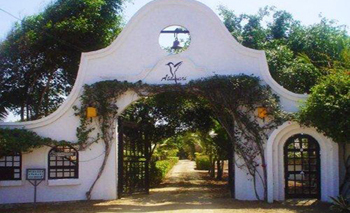 Alandaluz Inn is a clear example of alternative development thanks to the implementation of agroecological systems, bio-architectural techniques, recycling, craft recovery, emphasizing the environmental protection, and managing tourism activities with an ecological vision. 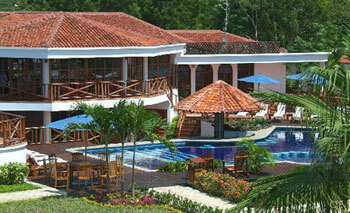 The Atamari Resort is located in the province of Manabi, which is on the coastal region of Ecuador. 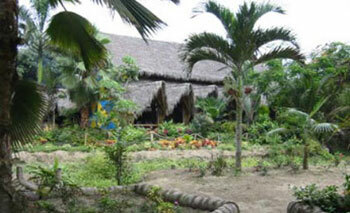 The resort is approximately two hours from Manta and Portoviejo. The name Atamari comes from Aymara (the language which preceded Quechua), and is the name of a species of hummingbird that lives in the area and frequents the Atamari's gardens. The Atamari Resort has a swimming pool, two restaurants (one interior with a capacity for 28 people and another outside with a capacity for 60 people), a bar with a terrace, two convention halls (one with a capacity for 25 people and the other for 80 people) and more. 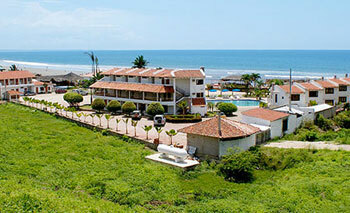 The Hotel Baja Montañita is located on the seafront, only 2.5 hours from the city of Guayaquil. It is surrounded by the major tourist attractions of the area such as the Isla de la Plata and the National Park Machalilla. The Hotel has a private beach with a bar and restaurant where guests can enjoy the tranquil surroundings and delicious cocktails. Baja Montañita also offers a spa with an ocean view in which to relax after spending time at the beach of Montañita. The hotel has been conceived as a small, artificial paradise. Located only a few blocks away from downtown, the guests don't need to walk more than 200 meters to the extensive beach El Murciélago or to go for a walk around the scenic boulevard. In Manta gastronomy lovers consider our restaurant as one of the best referring to it as the good table. Indeed our chefs can please the most demanding palates either in the habitual schedules or during special events dedicated to honoring the regional cuisine of several countries. You might enjoy a party inside our closed and air-conditioned lounge, the wide terrace outdoors, or beside the swimming pool. 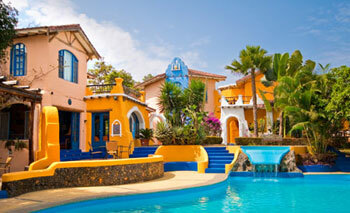 El Faro Escandinavo is located in the small village of San Lorenzo directly on the beach. Situated only 20 miles south of Manta, it is easily accessible by air from Quito or Guayaquil and by road from Guayaquil. The Hotel offers some exciting excursions and activities such as a walk in the San Lorenzo Cloud Forest, a visit the village of Pile, etc. The Faro also has an observation platform where you can watch whales during the appropriate season or simply enjoy a drink at sunset.